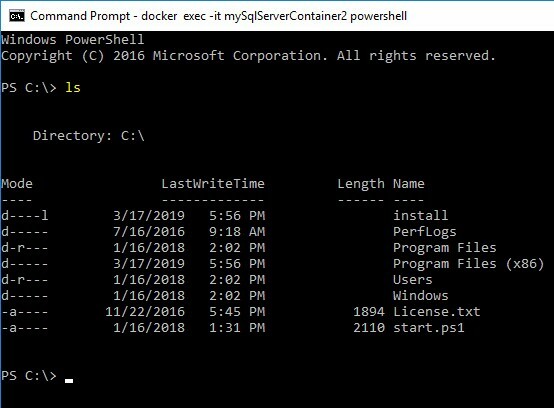 In my previous four posts I examined how to install Docker for Windows, pull a test image, search for a SQL Server on Windows image, install and interact with it (Part 0). I shared why I want to do all this (Part 1). I shared one way to execute SSIS on a container in Part 2. 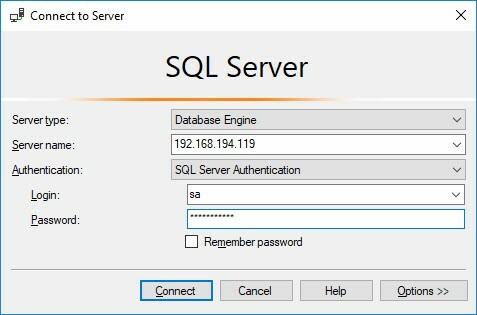 And I shared one way to (attempt to) add an SSIS Catalog to a SQL Server-on-Windows container in Part 3 (but that attempt failed). 4. This is another step closer to my ultimate goal. 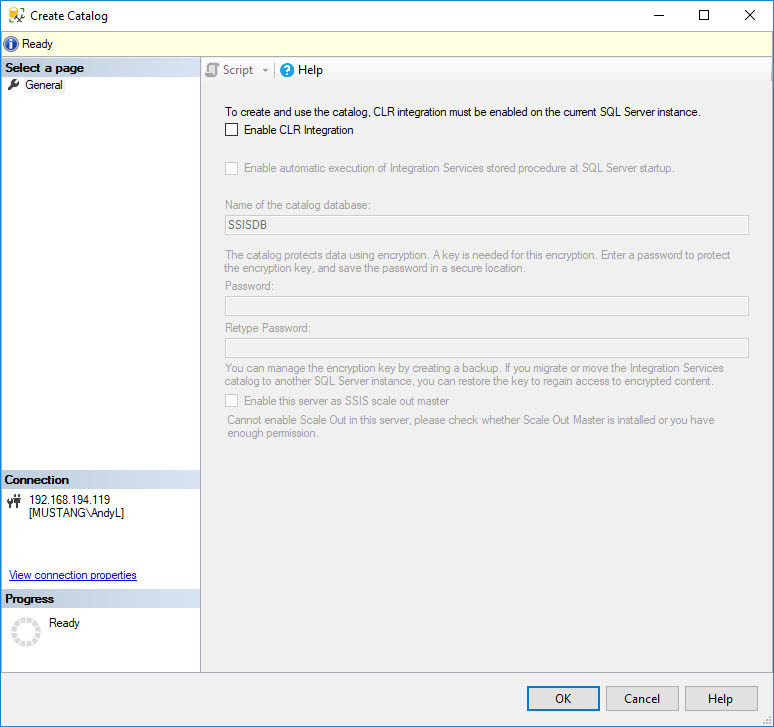 If you skipped the previous post titled SSIS, Docker, and Windows Containers, Part 3 – Adding the SSIS Catalog, Attempt 1, you need to do some things. If you worked through the last post you may skip to the heading “About Connecting…”. 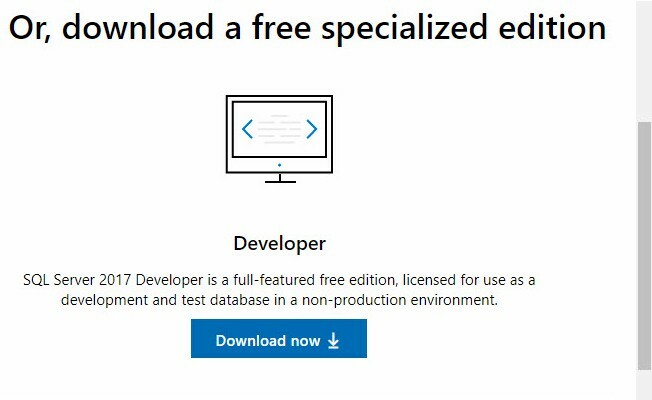 For more information about extracting SQL Server 2017 Developer Edition installation media to the file system, please see the post titled One Way to Extract SQL Server 2017 Installation Media. 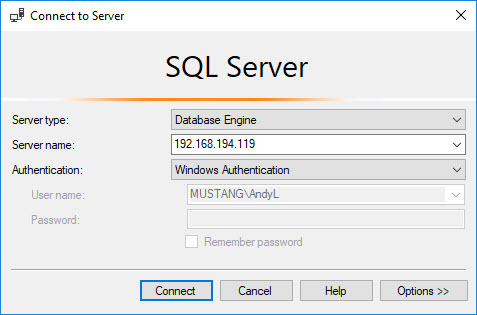 My goal is to connect to the instance of SQL Server that resides on my container using SQL Server Management Studio (SSMS). 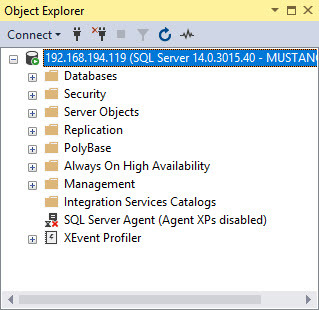 Once connected, I want to be able to interact with the SSIS Catalog on the container’s SQL Server instance. 2. 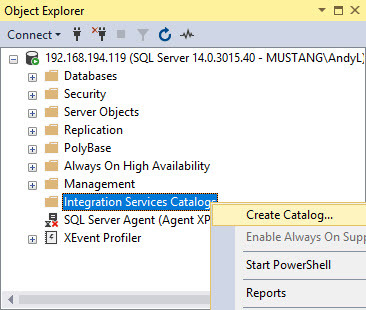 Interact with the SSIS Catalog. Open SSMS and paste the IP address into the Server textbox. 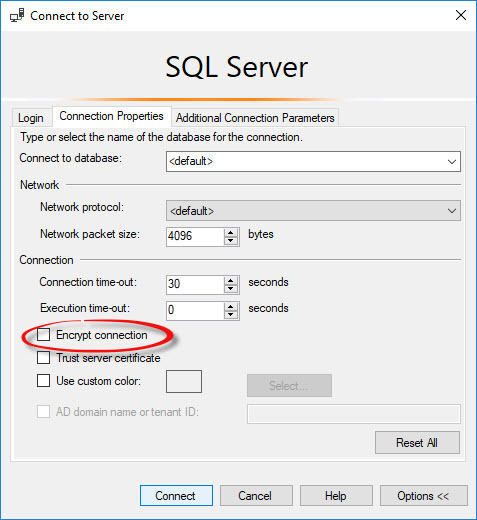 Set Authentication to SQL Server Authentication. Enter “sa” (without the double-quotes) into the Login textbox. Enter the password you configured for the a login when you started the docker container. If it is checked, un-check the Encrypt Connection checkbox. 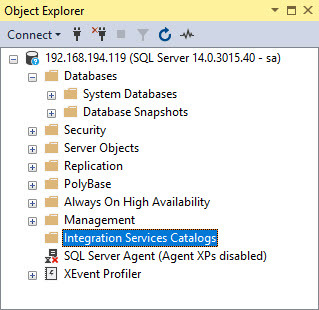 Expanding the SSMS Object Explorer’s Integration Services Catalogs node, we see… no SSIS Catalog. Well, remember the PowerShell script we executed to create the SSIS Catalog? It did not create the SSIS Catalog. 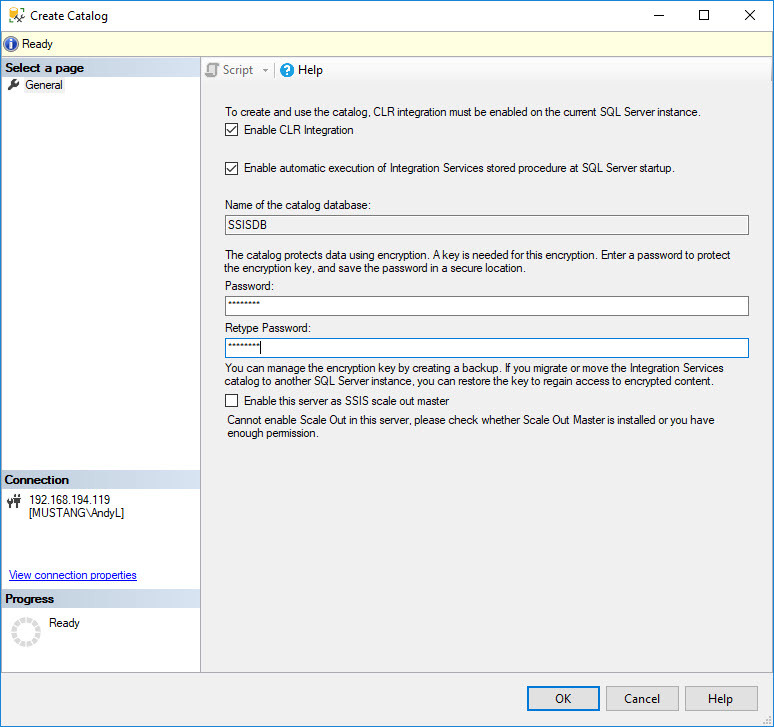 … you will learn some SSIS Catalog functionality will not work unless you connect using Windows Authentication. I know we must take a different approach. I first create a local administrator account. Login failed. The login is from an untrusted domain and cannot be used with Integrated authentication. The SSIS Catalog is created. No, really. 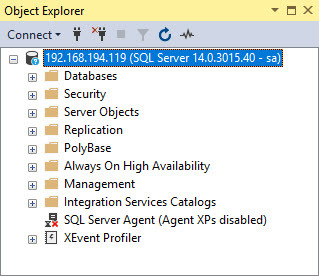 After two attempts I have an SSIS Catalog running in a SQL Server Windows container. 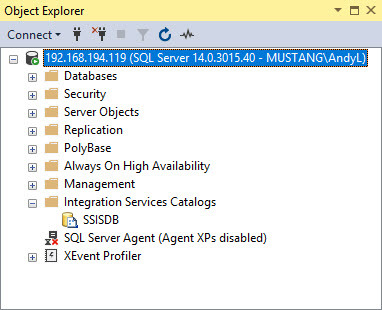 Next, deploying an SSIS project to this SSIS Catalog.